Have you read any of these? I think I’m gonna snag a few of them for my brother. He loves change-the-world with food documentaries. Fast Food Nation is one I’ve wanted to read for awhile, but I really dig the questions posed by the first book you listed. We are on a STUPID tight budget and if I didn’t do so much cooking from scratch I have no idea what we would eat?! Probably lots of Doritoes. And have you noticed your grocery budget stopping short lately? I am getting less and less for my $, and I basically buy the same stuff all the time so… what’s up with that, man? Thanks for the reading list, Deanna!! 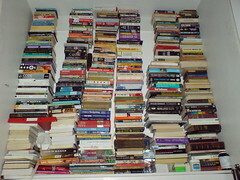 I have read a few, but others are waiting for my attention span to catch up. You know, I have noticed the price of yogurt, cheese and soy milk going up, but since I mostly shop at the farmers market, I don’t have a very good sense of store prices. Cooking from scratch is a definite money saver though! And you’re saving on future health care costs by not eating all that processed stuff! Yay, you!!! Great list Deanna! I just one-clicked Food Justice and Closing The Food Gap. 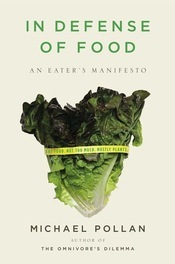 I would add Michael Moss’s new book (terrifying excerpt: http://www.nytimes.com/2013/02/24/magazine/the-extraordinary-science-of-junk-food.html?hp&_r=1&amp😉 and Michael Pollan’s new book, coming out next month, COOKED (about cooking real food from scratch, can’t wait). Happy reading! Wow! I didn’t know about Cooked! Have to add that to the growing list!!! I’ve pre-ordered this through iBooks! Coming Home to Eat and Animal, Vegetable, Miracle were two books that motivated me. Thanks! I haven’t read either, but my order list is getting longer!! I need to take time off work just to read! Yep Animal Vegetable Miracle was Abigail one for me too – very similar to your blog actually Deanna, I assumed you had read it!